Norman Cherner’s chairs, tables and casegoods have shown an enduring popularity since their introduction nearly fifty years ago. The molded plywood 'Cherner Armchair' is found in galleries and design collections worldwide including the Vitra Design Museum. Designed in 1958, the Cherner Armchair combines graceful curving bentwood arms with a unique molded plywood seat, which is constructed using plies of graduating thickness. 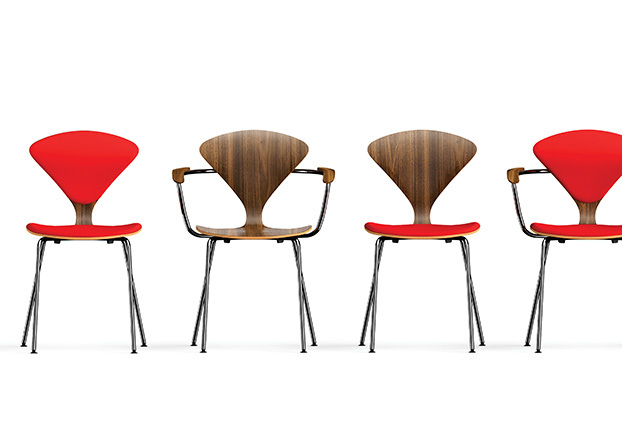 The Cherner Chair Company is the sole licensor of Norman Cherner designs. Our primary environmental philosophy is that you will never find a Cherner Chair product in a landfill. Cherner designs are featured in design collections worldwide, our products are manufactured to last, to cherish, and to hand down to future generations. All components of Cherner Chair products are replaceable, insuring that our chairs, tables, and stools can be indefinitely kept in service. We are committed to minimizing the environmental impact of all of our products.